Recovering Concrete Saves Resources, Eliminates Dumping. 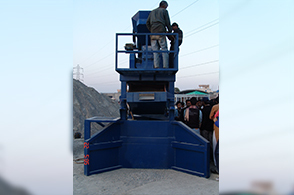 Recovering concrete requires the breaking, removing, and crushing of concrete to a specified size.Gondal Concrete Recovery plant has the ability to produce any desired gradation. After processing, the crush concrete makes an acceptable aggregate to use in new concrete, as with all construction materials, testing of aggregate and fines made from recycled concrete determines how it will perform. As long as the recycled aggregate can meet the requirements up to the standard for new aggregate, it can be used in concrete. Recycling concrete not only save the cost but at the same time, it plays an important role in the conservation of resources, and redirection of material that would otherwise be waste.